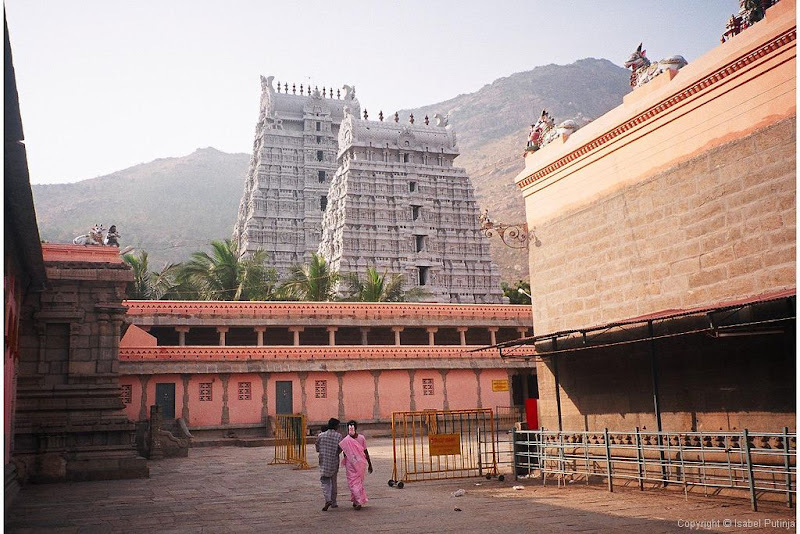 A few years ago I visited the temple town of Tiruvannamalai in Tamil Nadu. This town is famous for its Shiva temple which is one of the five Shiva temples in South India representing the five elements. Here the element is fire. 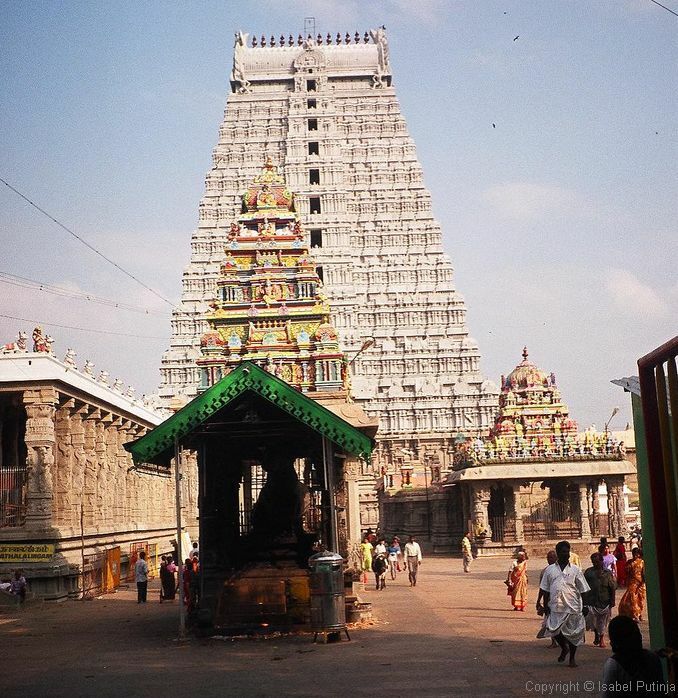 The temple is at the foot of Arunachala hill, another important landmark, which is considered to be the embodiment of Lord Shiva and therefore sacred. All this auspicious spiritual energy floating around makes Tiruvannamalai an important spiritual centre and home to several ashrams. I decided to climb the hill for the view over the town. The terrain was quite rocky and involved a lot of climbing over big boulders and slippery rocks which was quite strenuous. I soon found it was easier to climb barefoot. I put my sandals in my bag and continued climbing in my bare feet. Halfway up I stopped to admire the view of the huge temple compound below. Soon I was joined by a family from Australia who were travelling in India for a month. We climbed the rest of the way together. When we reached the top, the rock was covered with a sticky black substance. I put my sandals back on. These were the remnants of the Karthigai Deepam festival which is celebrated each year on the full moon day in the month of Karthigai (which falls sometime in November or December according to the Tamil calendar). 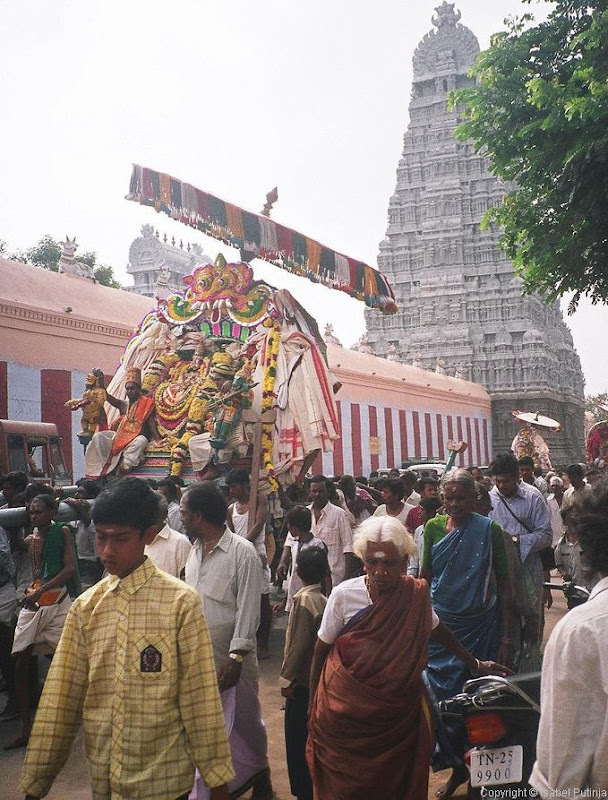 During this festival, a huge lamp is carried to the top of the hill. It’s filled with 3 tonnes of ghee and lit. The flame represents Lord Shiva and can be seen up to 25 kilometres away. 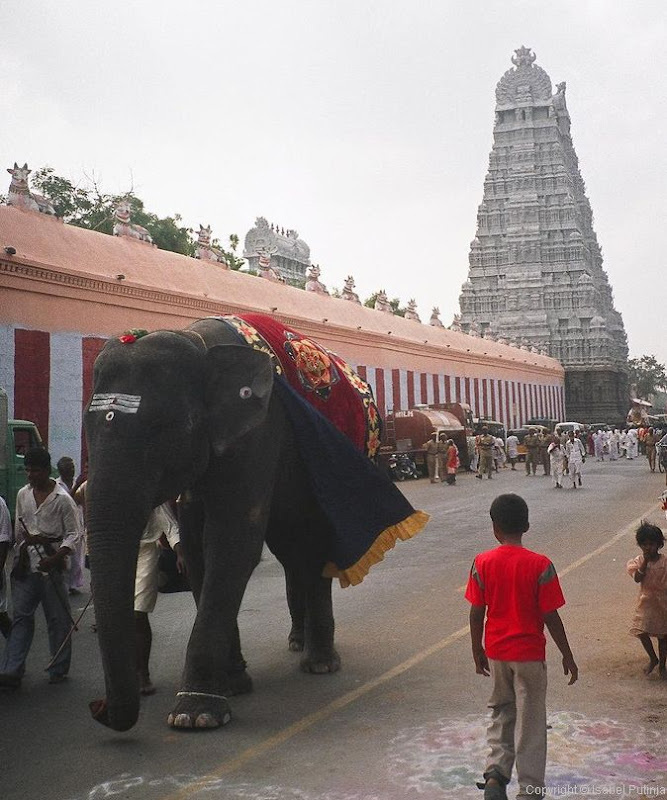 The next day I learned it was a full-moon day which is a special day in Tiruvannamalai. On each full-moon day, people come from the surrounding villages and towns to do a special pilgrimage which involves walking around Arunachala hill. This pilgrimage is considered to bring great spiritual benefits. During the day it was quite hot but there were already a few people walking along the 14-kilometre road which circles the mountain. By the afternoon there were more and more pilgrims – men and women of all ages and walks of life, some carrying children, others leading older people by the hand – all walking barefoot down the road. The police was busy closing traffic on the busy road. While I was having my dinner that evening at a roadside eatery I watched as the crowds on the road grew bigger and bigger. I decided to join them. The walk took about 3 and a half hours. There were several shrines along the way that people would stop to pray at. At the end of the walk the crowds dispersed at the big Shiva temple, climbing into buses which would take them back to their homes. Every human being, irrespective of race, religion or nationality MUST do it at least once in his or her lifetime. It doesn't matter if you live ten thousand miles away. You must make the trip to Arunachala just to circle the hill. The spiritual benefits of doing so can NOT be described in words.